End of WEG as we know it! As most have now heard, earlier this month the FEI announced what is effectively the end of the World Equestrian Games. Instead the FEI is going to go back to the individual Championships format that proceeded the WEG. When I wrote last month, I knew that was coming, the writing was all over the walls so to speak but that still doesn’t mean I wasn’t saddened from the sentimental standpoint when the official statement was made. My 12 days volunteering at the 2010 WEG here in Kentucky is certainly one of those amazing events of my life so to see the likely hood of having that kind of event here again become a long shot causes a level of disappointment. Now if you didn’t catch it, I said long shot, didn’t say an impossibility primarily because I will continue to advocate and one day if I get the chance, financially support an event of the caliber of WEG here in Kentucky. Not saying it will be the same exact format as what WEG was but I could see putting on a multi-discipline event at the Kentucky Horse Park that would provide a showcase of what the horse represents to the human spirit. On a more festive note, going to wish you all a Merry Christmas and Happy Holidays now because I am staying quite busy on a number of endeavors and so it maybe the end of next month before I make time to write again. I am thankful for all of you who follow my blog and who support my efforts. It’s been 8 years since Kentucky hosted the Games and the question I keep getting is will we get the Games again. I am of course optimistic that we will though the clock is running because the longer we wait, we loose the benefits of previously hosting them. When I say them most people figure I am talking the capital investments in that people feel for these kind of events you have to have brand new facilities. I disagree a bit with that assessment but the bigger loss is in personal capital, the people involved in planning the event and all those involved in the actual event, including an army of volunteers that was trained. Certainly the loss of Dr. Lyons early this year was a blow in many ways but there are certainly other Kentuckians who can pick up that torch and carry it so I certainly don’t see his loss as something that should prevent us from ever hosting the Games again, and I am sure he would be disappointed in a number of us if that was ever to be the case. I said this was going to be the short version, so let me get to where I see the Games since the Games at Tryon have completed. I will say right off the bat that the Games at Tryon did not go as I had hoped. It has always been important to me that the Games be successful no matter where they were held. This has never been a competition between Lexington and any other host city, this has always been a hope that the next Games would build on the prior. That Lexington learned from Aachen and then Normandy learned from Lexington and Tryon learned from Normandy and so on and so on. In my mind that is a key component to how I judge the success of any particular set of Games. In general I believe Aachen, Lexington and Normandy were a success in that the overall sentiment was positive and you had that sense of building something. Now before everyone assumes I am going to say Tryon was not a success and that I am going to pile on to the negative press that did arise from these Games, I am not. It serves no purpose in what I want to accomplish which is the continuation of the Games and the desire to bring the Games back to Kentucky. 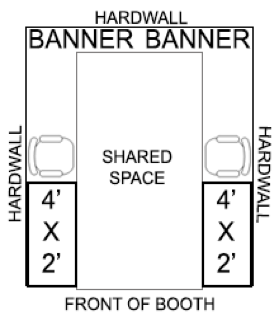 With that said, let me layout where we are and where we need to go from here. The first thing everyone needs to remember is that Tryon was not the original host and certainly to get into that would not make this the short version of what I wanted to provide. The reason I bring that up is because if Tryon hadn’t stepped in there may of not been a Games at all but in doing so Tryon was taking on hosting a highly complex event in what was really too short of a time frame. The leadership at Tryon had to be optimistic about what they were promising because to be realistic would of cost them the support to have probably pulled off what they did, which at some level was a bit of a miracle. Now with that said, I will say there were some areas where I think the leadership may have believed their own optimistic PR and didn’t really plan with reality in mind. In those cases I will say they over promised and under delivered and I will not excuse them of that. I am actually going to stop there because my real interest is in where this leaves us going forward. First I think the FEI needs to have a real hard look at itself and determine if they as an organization have the passion to provide the leadership that is needed for the WEG to continue. Now I am sure a few of you that know me are saying, WTF, that I would suggest that the WEG is not viable because of the FEI, actually, I can’t and I am not saying that, only the FEI can make that determination and it has to on the basis of what is best for the individual sports and those involved. The situation with Endurance is a clear example and there is no way to spin that, that doesn’t leave the sport of Endurance in a tough spot because of some real harm that was done to the sport and I think that will take some time and effort to repair. As of now no host for the 2022 Games has been selected and this presents a significant challenge for a pair of reasons. The obvious of course is the same problem Tryon found themselves in, lack of time. When Kentucky won the Games early in December of 2005 that gave us a little less then 5 years to get everything done, but what a lot of people never realize is how much planning had already been done at the one of a kind facility that the Kentucky Horse Park already was. The second reason is that who ever would host the 2022 Games has lost the chance to really get a behind the scenes look at the running of the actual event while its going on and you are actually able to take your initial plan and do some simulations against a real event in real time. So where does that leave us, my recommendation would be that we take a break and not have the Games in 2022 with the intent to make the 2026 Games a true showcase of what Equestrian Sport is, a sport like no other, because no other sport involves the relationship of two life forces like that of a human and a horse. I appreciate all of you who took the time to read my short version. The 2018 World Equestrian Games in Tryon #Tryon2018 , North Carolina are officially open. Of course on this the 17th anniversary of 9/11 plus the impending disaster that is Hurricane Florence the Games are not making the cut for the news networks beyond the local talk of the potential impacts of Hurricane Florence on the Games, which based on the latest forecast has the potential to be significant and I could see it causing postponements of some events this weekend. At the moment though everything is still on schedule with Endurance kicking things off at 6:30 AM followed by Dressage at 8:45 AM and Reining at 9 AM tomorrow. The one negative I have heard and seen posted has to do with the Grooms Housing, but as of tonight it is being reported that additional RV’s and other accommodations have been made for any of the Grooms who want out of what has been referred to as the “Shambles” or on par with military barracks out in the field. If you want additional background on this story check out what the British Grooms Association had to say on the matter, Grooms Accommodation at WEG. We will of course be keeping up with all the news coming out of Tryon and will be praying everyone, human and horse alike stays safe, has an incredible time and that the Games themselves are a great success. We Want You As A WEG Volunteer! The Organizing Committee is proud to announce that Monday, September 17, 2018 will be Community Day presented by Mars, Incorporated. 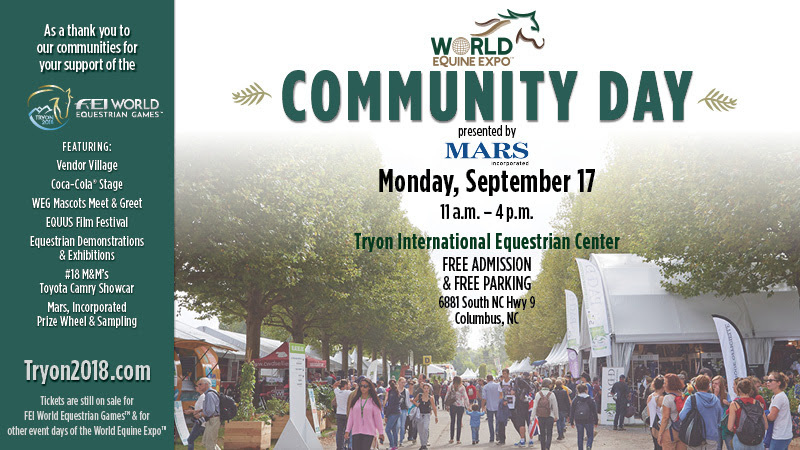 Open from 11 a.m. until 4 p.m., both parking and admission to the World Equine Expo™ will be free as a thank you to the regional North Carolina and South Carolina communities that have supported Tryon International Equestrian Center’s efforts to host the WEG this September 11-23. Click here to register to attend now! Impacts from the 2010 World Equestrian Games still being felt. I ran across a recent article discussing the ongoing positive impacts of the 2010 World Equestrian Games on Central Kentucky. The article just published this week in the Blue Ridge Now out of Hendersonville, North Carolina was titled, World Equestrian Games: Kentucky still feeling impact from 2010 event. What was interesting was the fact that just 2 weeks before I had been to the Kentucky Horse Park for the Junior League Horse Show and had remarked on how I felt the Horse Park continued to benefit from WEG. The Junior League Horse Show had previously been held at the Red Mile in downtown Lexington since the early 20th Century and is the longest running outdoor Horse Show in the United States. It was moved to the the Rolex Arena at the Kentucky Horse Park to maintain that record and though there were many concerns raised about it being moved I for one found that it was an improvement in multiple ways having it at the Kentucky Horse Park. The Rolex Arena had been upgraded for WEG and continues to pay dividends in the events it attracts and should do so for years to come. So check out the article in Blue Ridge Now for a good perspective on the impact of the Games now that enough time has past to provide a more objective view on their impact to the Central Kentucky Area. Plan Your Trip to FEI World Equestrian Games™ Tryon 2018 with the Official WEG Destination Guide! 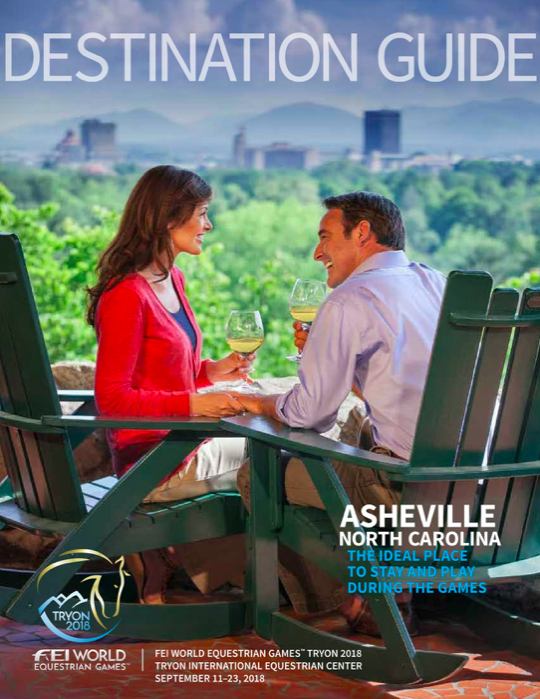 Download our official FEI World Equestrian Games™ Tryon 2018 (WEG) Destination Guide to plan your stay in North Carolina this September! Everything you need to know about visiting the Carolinas is there: what to do, where to explore, how to find the best food, and so much more! Click HERE to access the Official WEG Destination Guide! Mill Spring, NC – February 22, 2018 – Mark Bellissimo, Managing Partner and CEO of the International Equestrian Group and Tryon Equestrian Partners, announced today the inaugural annual World Equine Expo™ that will include the WEQx Games™ and World Horse Day™ and will run concurrent with the FEI World Equestrian Games™ Tryon 2018 (WEG) between September 11-23rd, 2018.The collective event theme is “Celebrate the Horse, Celebrate the Sport,” which honors and highlights the unique connection between horses and humans across the world. The Tryon International Equestrian Center (TIEC) team, location of the 2018 WEG, will release its #Together video highlighting this powerful connection between the World Equine Expo and the FEI World Equestrian Games™. Happy New Year everyone, 2018 is here and it looks to be an exciting and great year with Tryon hosting the 2018 Games, ticket sales opened 2 weeks ago and with the 2022 Games back up for bidding hoping to see Kentucky back in the hunt for those. But Šamorín refused to sign the host city contract despite “lengthy discussions” with the FEI. Šamorín’s decision to withdraw was announced by FEI President Ingmar de Vos at the governing body’s General Assembly in Montevideo. “We are confident there will be candidates, but these are complex Games and we need to make sure we do it right,” he said. Šamorín hosted last year’s FEI World Endurance Championships after stepping in to replace Dubai. The FEI’s membership approved the qualification process for the sport’s three Olympic disciplines: jumping, dressage and eventing – at Tokyo 2020. Plans to introduce a new scoring system for international dressage tests were also scrapped by the FEI following a mixed response from the organisation’s members. It would have seen the implementation of a “hi-lo” drop score, which removes the highest and lowest scores for each movement so an average mark is formed. De Vos claimed during his opening address that the sport was “expanding at an amazing rate” and was continuing to grow and develop. “In 10 years the number of events have more than doubled and we are now seeing a steady and annual increase of around eight per cent in terms of events and four to five per cent in terms of registered athletes,” he said. “These are incredible statistics – especially in this very diverse and competitive sports market. 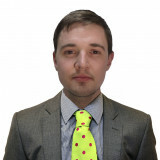 Since joining insidethegames.biz, in 2015 Liam Morgan has covered a variety of international multi-sport events and conferences, including the Baku 2015 European Games, the Lillehammer 2016 Winter Youth Olympics, the 2015 Pacific Games in Port Moresby and the 2015 Commonwealth Youth Games in Samoa. He has also reported from the FIFA Extraordinary Elective Congress in Zurich. He graduated from Southampton Solent University in 2014 with a BA First Class honours degree in Sports Journalism. Tryon, NC, USA – September 12, 2017 – The one year to go countdown to the FEI World Equestrian Games™ Tryon 2018 (WEG) was launched today. With more than 500,000 people expected to attend the 2018 Games, the 12-day spectacle of equestrian champions is one of the biggest events on the global sporting calendar and will be the largest equestrian event in North Carolina’s history. Mark Bellissimo, CEO of host venue Tryon International Equestrian Center (TIEC) in Tryon, NC, announced today that tickets will go on sale to the public on Monday, October 16, 2017. Competition action at WEG 2018 runs from September 12 through September 23, 2018, with the Opening Ceremony scheduled for September 11. A variety of ticketing types and prices will be offered such as an All Games Pass for each week of competition or both weeks, an All Session Day Pass, All Session Discipline Pass, as well as individual event tickets, and opening and closing ceremonies. Ticket prices vary, but include an inexpensive Day Pass that gives attendees access to event grounds and expo only. A complete list of ticketing options will be available online at www.tryon2018.com or www.ticketmaster.com. In addition to announcing ticket sales, TIEC has today released a “Destination Tryon” video to showcase the region where the 2018 Games will be held. Prior to winning the bid to host WEG 2018, Polk County, North Carolina dwelt as a hidden gem, tucked away in the bucolic Blue Ridge Foothills, bordering South Carolina. Surrounded by bold mountains and scenic foothills, the area is conveniently located within an hour of top cities including Asheville and Charlotte in North Carolina and Greenville in South Carolina. The rural community now joins the league of iconic destinations around the world – like Normandy, Stockholm, Rome and Aachen – to host equestrian sport’s most distinguished championships. Click here to watch the Destination Tryon video as part of the one year countdown to the FEI World Equestrian Games™ Tryon 2018! For WEG 2018, Bellissimo is focusing on the love of horses to bring added attention to equestrian sport and touch a broader audience of horse enthusiasts globally, highlighting the important role horses have played throughout history. “All of our nations were discovered on the back of a horse and these amazing animals continue to provide livelihood, transportation, security, entertainment, friendship, therapy, and sport around the world. The love of the horse is universal and profound. The Games is an incredible stage to show the world how important and valuable this creature is and celebrate our relationship with them,” said Bellissimo. Fédération Equestre Internationale President Ingmar De Vos shared his excitement about the forthcoming Games at TIEC. United States Equestrian Federation (USEF) President Murray Kessler is pleased that the WEG is coming back to the United States for 2018 and will be hosted all at one venue at TIEC. “We are confident that Mark Bellissimo and his team at Tryon will host an exceptional World Equestrian Games next year. Having the Games in the U.S. gives us an opportunity to celebrate the joy of horse sports with millions of Americans in a way that will help grow engagement and participation in all equestrian sports in this country.” said Murray Kessler, President U.S. Equestrian. The Games are expected to have tremendous economic impact to both Western North Carolina and the South Carolina Upstate. The previous WEG held in Normandy (FRA) in 2014 had an estimated economic impact of $400 million and attracted 575,000 spectators. North Carolina Governor Roy Cooper praised the organizers’ success in bringing the Games to the Carolinas. Held every four years alternating with the Olympic Games, the FEI World Equestrian GamesTM combines the world championships for jumping, dressage and para-dressage, eventing, driving, reining, vaulting and endurance into one massive 12-day event. Accommodations for the 2018 WEG are being managed by Connections Housing, a full-service sourcing, housing and event management company. With 30 years of experience serving events in a range of industries, Connections has two full-service, fully-owned call centers and will oversee all aspects of the housing process from contracting and room block management to reservations and post-event analysis. Accommodations will be open to the public on Monday, September 18. For more information about accommodations, please visit www.tryon2018.com. For more information from the FEI, please contact Leanne Williams leanne.williams@fei.org or at 0041-21-310-4747. Tryon 2018, is one of the world’s premier equestrian lifestyle destinations. From carousel to competition, the mission of Tryon Resort is to celebrate the magic of the horse, grow equestrian sport, and increase access to this majestic animal. With first-class facilities for hunter/jumper, dressage, and eventing competitions, the facility will soon accommodate all eight equestrian disciplines. Tryon Resort is a spring, summer and fall haven for equestrian competitors and enthusiasts, and a year-round destination for connoisseurs of diverse cuisine and shopping, lodging getaways, and family entertainment. Learn more at www.tryon.com. Some news on plans to promote recycling for the 2018 World Equestrian Games in Tryon. As with any large public event waste management is always one of the big things that never seems to get the attention it needs, primarily because we don’t want to think about how much waste we generate. In this case the local Polk County Government is making plans to address the issue. WHEREAS, involvement of the Tryon International Equestrian Center is critical to the establishment of an effective solid waste and recycling program for an event of this magnitude. NOW, THEREFORE, BE IT RESOLVED by the Polk County Board of Commissioners and the Polk County Recycling Advisory Board to hereby support and encourage the development and implementation of practices and policies by Tryon International Equestrian Center to further the aims of waste reduction and recycling during the 2018 FEI World Equestrian Games. Tryon 2018: 438 Days and Looking Good! Wanted to say that I like what Tryon has done for their title logo for the Games, simplistic but catchy, so far that is the vibe I get from the information I am seeing. That gives me a good feeling about how these Games are going to go because its easy for these kind of events to get complicated in ways they don’t need to be and nothing good comes from that but Tryon looks to have a good plan and is executing that plan effectively. 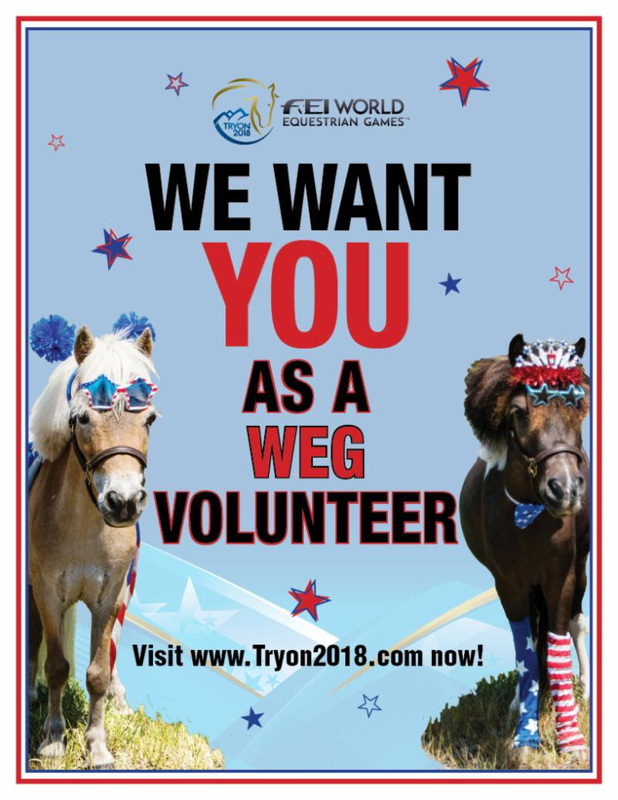 The request has went out for volunteers for the 2018 World Equestrian Games at Tryon, North Carolina. The Games are scheduled to start September 10, 2018 and go through the 23rd, though as a volunteer you are not expected to do every day of the Games. For the 2010 Games I did 12 of the 16 days and I was being a bit of an over achiever. If you are like most people and you can spare a week though I recommend doing at least 4 or 5 days as a volunteer and this will leave you some time for travel and a day or two to be a spectator while you are there, this is probably what I will end up doing. The hope with an event like this is to have no more then 3 distinct sets of volunteers which means you need them to average 4 or 5 days and to have some overlap. I hope many of you will sign up, my experience at the 2010 World Equestrian Games is something I will always remember and cherish.